Mammographic density is an established breast cancer risk factor within many ethnically different populations. The distribution of mammographic density has been shown to be significantly lower in Western Australian Aboriginal women compared to age- and screening location-matched non-Aboriginal women. Whether mammographic density is a predictor of breast cancer risk in Aboriginal women is unknown. We measured mammographic density from 103 Aboriginal breast cancer cases and 327 Aboriginal controls, 341 non-Aboriginal cases, and 333 non-Aboriginal controls selected from the BreastScreen Western Australia database using the Cumulus software program. Logistic regression was used to examine the associations of percentage dense area and absolute dense area with breast cancer risk for Aboriginal and non-Aboriginal women separately, adjusting for covariates. Both percentage density and absolute dense area were strongly predictive of risk in Aboriginal women with odds per adjusted standard deviation (OPERAS) of 1.36 (95% CI 1.09, 1.69) and 1.36 (95% CI 1.08, 1.71), respectively. For non-Aboriginal women, the OPERAS were 1.22 (95% CI 1.03, 1.46) and 1.26 (95% CI 1.05, 1.50), respectively. 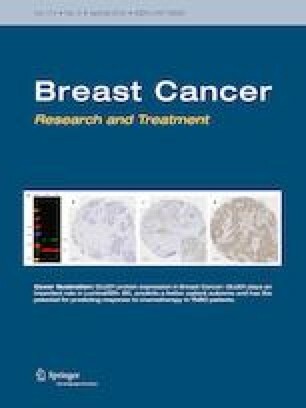 Whilst mean mammographic density for Aboriginal women is lower than non-Aboriginal women, density measures are still higher in Aboriginal women with breast cancer compared to Aboriginal women without breast cancer. Thus, mammographic density strongly predicts breast cancer risk in Aboriginal women. Future efforts to predict breast cancer risk using mammographic density or standardize risk-associated mammographic density measures should take into account Aboriginal status when applicable. The online version of this article ( https://doi.org/10.1007/s10549-019-05225-9) contains supplementary material, which is available to authorized users. The authors would like to acknowledge BreastScreen Western Australia, The Aboriginal Women’s Reference Group and the Government of Western Australia Department of Health Data Linkage Branch. This work was supported by Cancer Council Western Australia and Cancer Australia (APP1085750). Author JS is a National Breast Cancer Foundation Research Fellow. All procedures performed in studies involving human participants were in accordance with the ethical standards of the institutional and/or national research committee (Western Australian Department of Health Human Research Ethics Committee (Project #2014/50) and the Western Australian Aboriginal Health Ethics Committee (Project 581)) and with the 1964 Helsinki declaration and its later amendments or comparable ethical standards. A waiver of informed consent was received to obtain access to de-identified linked data.